I’m working on a blog project looking at technical celebrations of marine traffic around the coast for bloc in Wales Fishermen Friends inspired by MarineTraffic OldWeather amongst other things and most recently @amcewen ‘s work on @merseyshipping on twitter. Anyway have a look at the Fishermen Friends link. 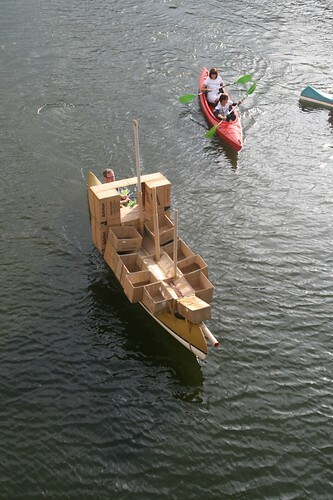 I’m planning on organising some kind of tracking mini event soon with our pedalo just to experiment with a GPS device like this maybe initially just around the docks with the aim of getting something we can use in all future activity that might need tracking from a canal trip to Leeds to a channel crossing (gulp). So my bloc project could be a context for prototyping and testing something out. Love the idea that at any time we could see where the Swan was and tag it with what it was up to. Would be nice to meet tomorrow Thursday 13th May 2011 5pm at STATIC in Liverpool and discuss this and the upcoming light night event and maybe we could hed down to Simon’s test at Wowballs at the docks. In the meantime do delight in the progress of some real Whooper swans in Iceland above and my last slightly surreal waterbourne project Close Encounters in Poland below. 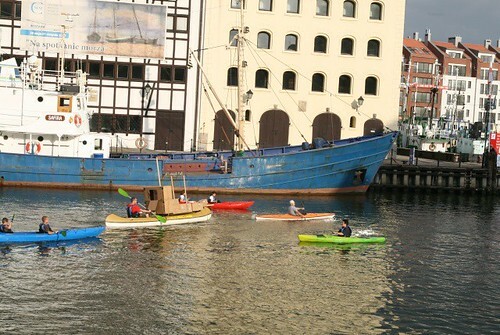 I worked with a local canoeing club (who ended up towing me) and the owner of a spanish galleon (yes really) to sail a cardboard ship attached to a canoe down the canal in central Gdansk Poland for Laznia Centre for Contemporary Art. If only I could have tracked it live… hope to see some of you tomorrow! This entry was posted in experiments, ideas, tracking by admin. Bookmark the permalink.